I really like salmon. I also like convenience. Know what’s convenient? 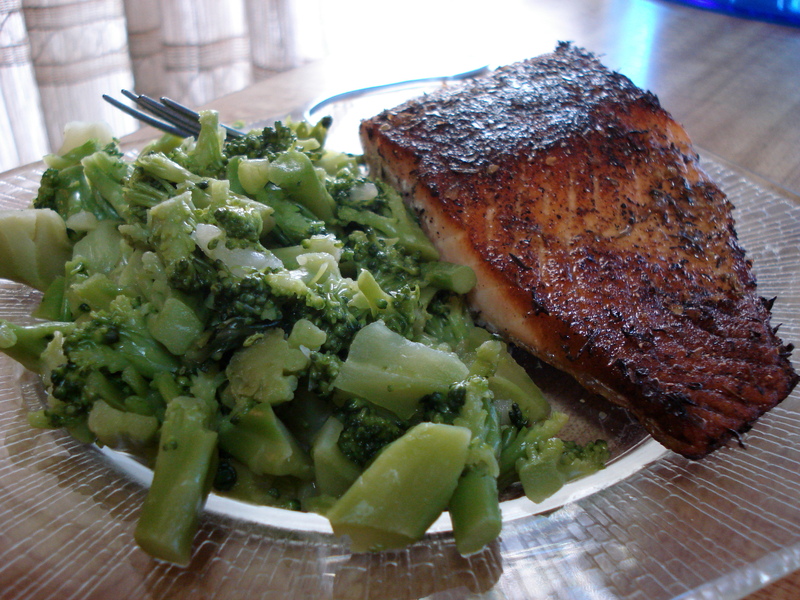 Those single-serving 4 or 5 oz pieces of salmon that come vacuum-sealed in the freezer section of your local food store. I put them in the fridge a day or so before I know I’ll use one, so it can defrost in the fridge. When strapped for time, they can defrost quicker by putting it (still sealed) in a bowl of water on the counter for about 30 minutes to an hour. Once defrosted, pat dry and just apply some olive oil on that baby, sprinkle on some spice, and you’re good to go. 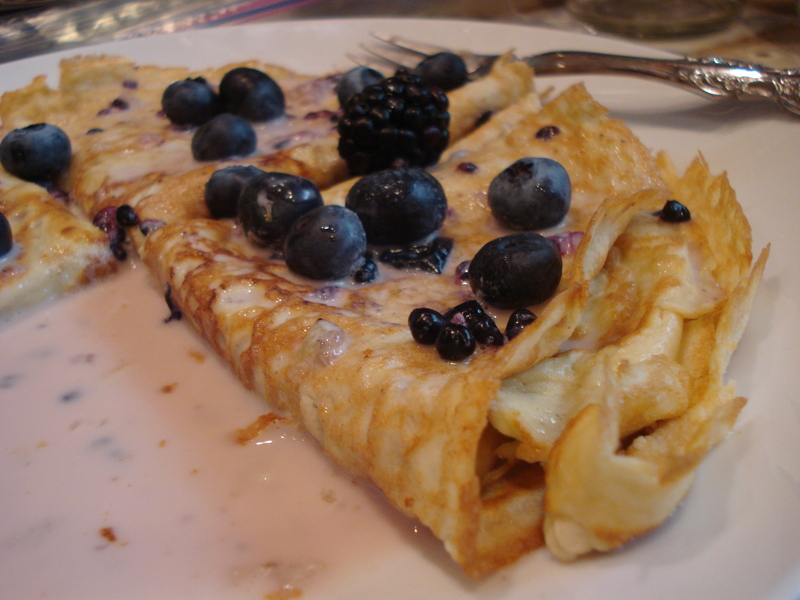 I found this recipe at PaleoEffect.com, and it’s great. Definitely worth a share…. and it’s nice to make your own spice blend so you know exactly what’s in it. Click here for the recipe! One of the goals of this blog is to share delicious (and healthy) recipes. I’ve had several co-workers and friends ask me for recipes to try, so I hope this blog helps with that. Since I’m trying to stick with the Paleo diet right now, most recipes will be paleo/primal. And since the internet is already super-saturated with talented food bloggers, most of my recipes are ones I find online. Hopefully as I become a more seasoned cook, I’ll share highly-original, mind-blowingly awesome recipes that I create myself. Rinse the kelp noodles thoroughly and set aside. Cut the chicken breasts into chunks. In a large (I’m not kidding — it needs to be big!) saute pan, heat the sesame oil on medium. Once oil is hot, add the chicken chunks and cook until no-longer pink. Once the chicken looks about done, add the remainder of ingredients (except the sesame seeds). Constantly stir the spinach and mushrooms until they have wilted and browned, respectively. Then add the kelp noodles and sesame seeds. Continually stir for several minutes until the kelp noodles have absorbed the flavors in the saute pan and turn a nice light golden color. Hope you enjoy. 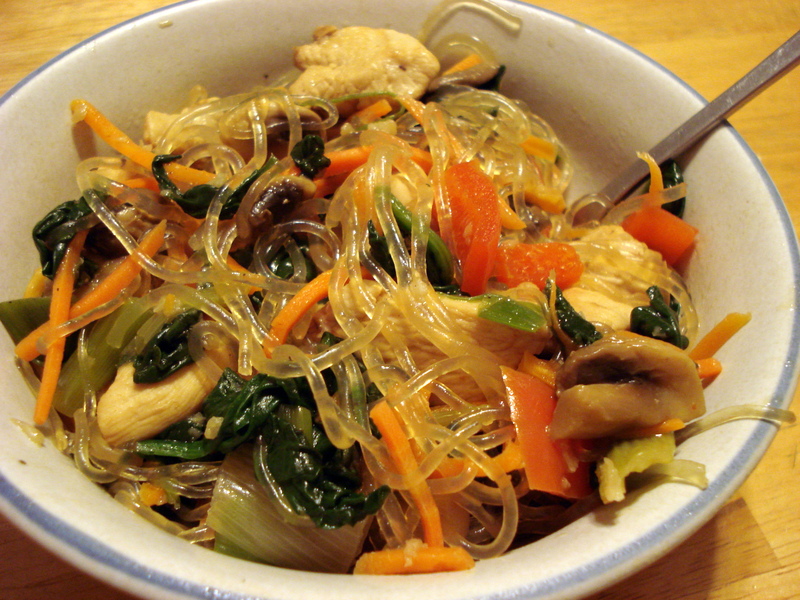 Kelp noodles are pretty cool actually — I’ve used them many times as a pasta substitue. They’re very neutral in flavor, and supposedly supply a good amount of iodine. They have a bit of a crunch to them — if you want it softer, you can boil the kelp noodles before using them in this recipe. That’s what the original recipe calls for — I just like my noodles al dente. Okay so there you go! My first shared recipe! Yippeeee!